Politics: Is It Mitt Romney's Fault Ron Paul Is Winning Delegates? 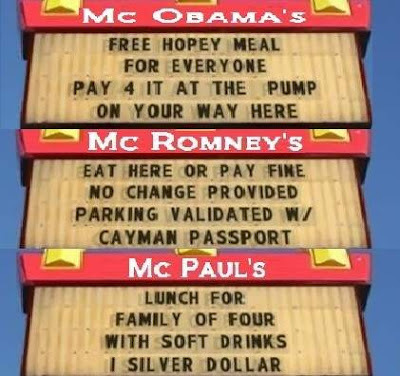 Is It Mitt Romney's Fault Ron Paul Is Winning Delegates? As the Mitt Romney 2012 campaign takes on President Barack Obama as though the Republican Presidential Primary is over, the Ron Paul 2012 campaign carries on its well-planned strategy of picking up delegates in caucus states. Ron Paul's campaign website continues to announce one state after another the delegate wins in Louisiana, Minnesota, Iowa, and Colorado to the chagrin of ant-acid popping establishment king makers in the national and state Republican parties. Ron Paul's team also alludes to picking up more delegates in other states in the near future, including Mitt Romney's home state of Massachusetts. While critics may claim that Ron Paul supporters are hijacking the delegate process, the real reason why Ron Paul is able to garner votes could be due to the type of Republicans he attracts: informed, active, and enthusiastic. Meanwhile, it is no secret that Mitt Romney has had to rely on a huge war chest to decimate his opponents with negative ads while not giving voters a reason why they should choose him other than he is not Obama. Casual voters who are easily swayed by negative campaign ads was the demographic that the Romney campaign went after to compensate for an otherwise weak candidate with a moderate message. Romney had as many bad gaffes as Texas Governor Rick Perry during this election cycle and would have otherwise fallen by the wayside early like Perry but for millions of dollars of Super PAC cash propping up a yawn of a campaign with those signature white shirt and blue jeans singing performances of 'America the Beautiful'. For a supporter to participate in the time-consuming delegate process from precinct to county to congressional district to state convention requires belief and commitment to a candidate's message. Had Romney been able to attract people passionate for his campaign with a strong political message, he would have had no problem picking up delegates commensurate with the popular vote. As the old saying goes, money can't buy love (even if it can win an election). Can A Gannett Newspaper Endorsement Be Trusted?